A unique fusion of geography and communication by Cowdenbeath student Lucy Jamieson has impressed at the Gray’s School of Art annual Degree Show. Lucy (23) developed an exhibition which looks at how she communicated with her family in Fife while she lived in Aberdeen. The former Beath High School pupil has been studying Three Dimensional Design at Gray’s and has used traditional crafts with a contemporary twist for her work. Lucy’s exhibition showcases a number of items including several detailed glass hands, a patchwork necklace and a number of modern pinch pots. She said: “It has been a lot of fun working on my Degree Show exhibition. The glass hands have attracted a lot of attention and I developed them to signify the lack of meaningful verbal communication between people. “The hands were made as ornaments for the home, allowing people to have casts of their own hands and family members. The words can also change allowing them to have a more personal message, such as their family name. “It’s a way of subtly making ornaments in the home more personal rather than the genetically mass produced objects out there today. “The sign language was a way of conveying how much we rely on our hands to express a feeling or to communicate to one another, subconsciously we talk more using body language than we do with our words. The pinch pots on display were made to signify the distance between Aberdeen and Fife and have been designed to be easier to hold than other bowls with thumb grooves. A lace doily lampshade was also made in tribute to Lucy’s grandmother who passed on the skills to make them when she was a child. 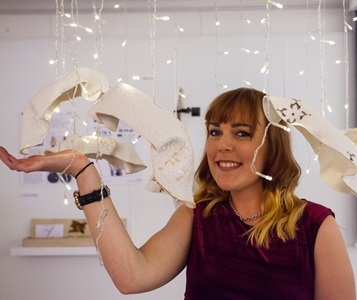 The talented student will graduate with a BA (Hons) in Three Dimensional Design from Robert Gordon University in July and hopes to become an artist-in-residence at Gray’s to work on special commissions, residencies and continue to develop her creative skills. Gray’s School of Art Degree Show 2014, sponsored by BP, showcased a plethora of undergraduate talent across a range of disciplines including 3D and product design, painting, printmaking, sculpture, fashion and textiles, graphics, digital media, visual communication, photography and electronic media.